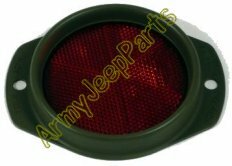 Reflector, red w/housing, Guide A2 marked. These are high quality of the originals.\r\nOnly difference is the lense which does not have the script Guide marking. Reflector, red w/housing, Guide A2 marked. These are high quality of the originals. Only difference is the lense which does not have the script Guide marking.